Monitoring and adjusting soil pH is important for plant health. Many homeowners have stated that they understand the pH of the soil is important, but are not sure why or what to do about it. If you find yourself in that category, then this page was written for you. It contains basic pH soil science and materials used to adjust it. The entire world’s plants, including flowers, trees, and food crops, (yes, even turfgrass) have a preferred pH range they will grow best in. In the wetter states east of the Mississippi, the tendency will be toward the acidic side of the scale. This is due in part to sulfur found in rain water. The more arid states west of the Mississippi are slightly alkaline. Exceptions in the West are the wetter, mountain areas, which often have a slightly lower pH. Most plants will grow best in the mid-range of 6.0 – 7.0 on the pH scale, but there are many exceptions. When the soil pH is outside of the plant’s tolerance range, the plant’s health will decline and may even die in some situations. The information below will help you understand the pH scale and the relationship it has with your plants. The letters pH stand for "potential Hydrogen" and represents the measure of Hydrogen ions in the soil. The soil pH is measured on a scale of 0 to 14. A reading of 7.0 in the middle represents "neutral". A reading of below 7 is considered to be acidic (sometimes called "sour" soil) while any measurement above 7 is basic or alkaline (sometimes called "sweet" soil). Most all plants will only grow within a range of a couple degrees either side of neutral. Here’s why? Each whole number on the pH scale represents a factor of 10. That means that a soil pH of 6 is ten times more acidic than a soil pH of 7. A soil pH of 5 is 100 times more acidic than it would be at 7. As will be explained later, the pH affects the soil’s chemistry. When the soil pH drops below 5.5, certain vital nutrients are blocked from being taken up into the roots. It is the same with high alkaline soils. If you have submitted a soil sample through the county extension office or directly to a testing lab, you will receive a soil analysis report. The report will indicate the "active pH" as well as the "buffer pH". Although I have found that some labs may not actually have the words "buffer pH" in the report, what the buffer pH reveals will usually be in the report. Click here for help understanding a Soil Analysis Report. Active pH is the measure of free hydrogen ions that are presently in the root zone when the test is performed. These hydrogen ions bind with other nutrients, making several important nutrients unavailable to plants. Hand held pH meters, including the one above, test for hydrogen ions. Lime (calcium Carbonate) in the soil neutralizes free hydrogen ions by converting the excess hydrogen to water, thus freeing up nutrients. Where there is an inadequate amount of lime, the test will reveal higher amounts of hydrogen ions. In other words, when less hydrogen ions are found, the more alkaline the soil will be. The more hydrogen ions that are found in the soil, the more acidic the soil will be. 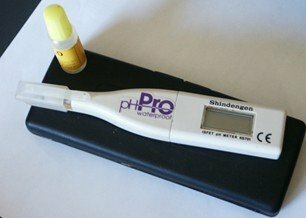 The active pH is what is measured when using any of the many types of hand-held home pH soil test kits. The buffer pH measures the soil's resistance to change and can only be measured in a lab. Based on your soil sample, buffer pH indicates the amount of corrective material that is needed to bring the soil back to the correct pH. For example, a low pH soil containing generous amounts of organic matter or clay would require more lime to bring it back to neutral than would be needed for a lighter soil. Since all soils are different, it takes differing amounts of corrective material to make the adjustment. Some labs will not have the words "buffer pH" in the report, but will simply state the amount of lime need to bring the soil back to the proper pH. This amount, however, is determined by what is revealed in the buffer pH test. Important: It is a common belief that you can indiscriminately apply limestone to your lawn because it always "improves the soil". Limestone only improves the soil if an improvement is needed. The purpose of limestone is to alter the soil pH and it is possible to apply too much or to over-correct. Incorrect soil pH can cause several problems. As the pH falls or rises too far from neutral it alters soil chemistry and changes nutrients into forms the plant’s roots cannot take up. Tests that reveal pH above 8 where excessive lime was not applied, generally have other problems that push the pH upward. Excessive sodium (salt) or other materials can have that effect on soil pH with the result of binding nutrients and adversely altering soil structure. In alkaline soils, phosphorus, iron, boron, and zinc become increasingly bound up and unavailable to the plants. All of these are needed for good plant function. Phosphorus is one of the top three plant nutrients needed for plant development. Iron is the most common micro-nutrient deficiency in alkaline soils and is known as "iron cholorosis". Low pH soils reduce phosphorus and magnesium to plants and can cause aluminum and manganese toxicity in severe cases. Magnesium is essential for chlorophyll production. Chlorophyll gives grass its green color and is a major part of photosynthesis. When lacking magnesium, the grass will be pale green in color. To make acidic soils more alkaline, we use lime. Lime works by neutralizing hydrogen in the soil. Below is a description of the different lime products often used on lawns. These products don't work immediately, but must work themselves down into the soil. The response time will be different depending on your soil, how much is needed, and what material you use. Some can be applied using a home fertilizer spreader. Agricultural limestone-- This is the product most often used. It can be purchased at farm and garden stores or farm feed stores, etc. Agricultural limestone has a much less potential for burning than other lime products. It comes in small pellet form or ground (almost powder) form. Some new products are in pellet form, but dissolve when watered in, so it can begin working faster. Dolomitic Limestone-- Dolomitic limestone contains magnesium. This is a great product for acidic soil that is also low in Magnesium. Here you knock out two birds with one stone. Neutralize hydrogen and restore Mg levels are well. It can be purchased in the same forms as agricultural limestone. Hydrated limestone-- Hydrated lime is what is used in mortar or cement products. It is sometimes used on lawns because it works slightly faster, but has a much greater burn potential. Hydrated lime should not be used on Centipedegrass or other grasses sensitive to lime. When using hydrated limestone, it should only be used in small amounts in the cooler parts of the year. Be sure to water it in. Wood ashes-- Wood ashes are only 40 percent as effective as limestone, but may be a good choice when only a slight correction is needed. However, be careful about using your garden as a place to dump ashes throughout the winter. Some gardens have recorded the soil pH in the top third of the scale. When pH is that high it can take several years to restore the pH back to neutral. Gypsum-- The use and effects of gypsum is the least understood by homeowners and some professionals. Gypsum is a calcium sulfate product that is often used as a lime material, but it is the least effective. While gypsum has the ability to raise the soil pH due to calcium (neutralizes soil Hydrogen), the sulfate in gypsum forms sulfuric acid and re-acidifies the soil. The affect is that the calcium and the sulfate cancel out the affects of the other. Gypsum has a purpose, but liming is not one of them. Gypsum’s greatest benefit is when used to correct salt affected soils. For more information on how gypsum works, click on our link The Truth About How Gypsum Really Works. Note 1: Limestone is slow to break down and is best if it can roto-tilled into the soil, when possible. When broadcasted over the grass surface, the smallest limestone particles will work into the soil faster than larger particles. While powdered limestone is much messier to work with, it will alter the pH faster. Again, one of the best products I have used is a specially manufactured pelletized limestone for easy and clean spreading, but quickly melts down to fine particles when watered in. Note 2: The purity of the lime product varies with the manufacturer. Products are rated for purity using a Calcium Carbonate Equivalent (CCE) rating. A rating of CCE 100 is pure, but cheaper products may be as low a CCE 60. If you use a cheaper product you will have to use more to get the same results of a CCE 100 product. When the soil is too alkaline, it may be necessary to lower the pH. There are basically two different materials that are used: Sulfur and Aluminum Sulfate. Sulfur- Sulfur is an age-old product. The drawback is that it can takes months to affect the pH. It requires the activity of soil microbes to break it down first. Aluminum Sulfate- This is the product most professionals use because it works immediately. Compost top dressing is a fairly new practice for home lawns yet, it is one of the best things you can do. Get helpful advice and step by step directions for the best possible results. Do you know what is in a bag of fertilizer? This is a breakdown of the nutrients, what they do, and why they are important. Organic lawn care is increasing in popularity and for good reason. Click here for an unbiased look at the science behind organic fertilizers and how to use them properly for the best results.